I don’t know about you, but I love a good Crockpot Soup Recipe! Today I’m going to show you this easy Kale Garbanzo Italian Seasoned Soup Recipe that you can make in your Crockpot!! This recipe is packed with flavor and nutrients. It has celery, carrots, corn, onion, kale, garlic, zucchini and much more! You could even add some sausage to spice it up a bit! 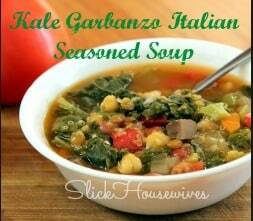 Either way, I bet you will enjoy this Kale Garbanzo Italian Seasoned Soup Recipe! If you enjoy this recipe, be sure to check out Peppered Beef Stew and Classic Hungarian Goulash Recipes. Place ingredients (except Parmesan) in the crockpot and stir. Serve hot with good crusty bread and a little Parmesan sprinkled on top. Ohh, this looks really good. I've never tried Kale but I've heard so many good things about it. I wanted to get some to make Kale chips but I'll have to get a good amount extra so we can try this soup!! I love using my Crock Pot for meals and this sounds like a great soup recipe. I'll grab some kale next time at the store so I can try this. Thanks!